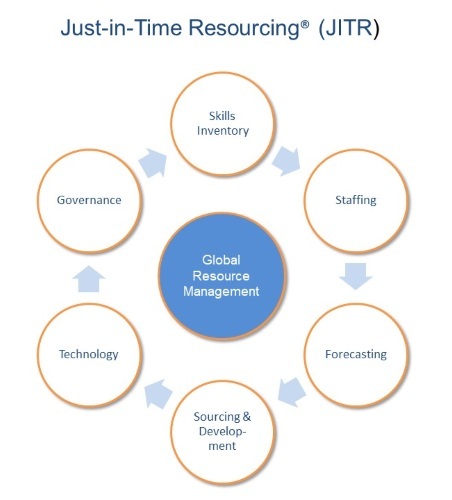 The Resource Management Institute teaches Global Resource Management (GRM), a process methodology developed for achieving highly efficient deployment of human capital as part of the Just-in-Time Resourcing® brand of human capital management solutions. Whether your company is large or small, efficiently managing human capital will mean the difference between success and failure. Outlined below are the key elements of what we teach for the RMCP® certification. Skills Inventory – Learn the fundamentals of Skills Management, how to build deploy and maintain your own repository, and how to use the content to facilitate staffing decisions. Staffing – Understand the tools and techniques for staffing, including how to collect, compare and analyze your resource supply and project demand data. Sourcing and Development – Learn strategies to address peak load planning and the importance of how and from where you plan to add team-members. Also, learn how to close your staffing gaps in the three most common situations and how to use your internal HR department and vendor-partners to their fullest extent. Technology – Learn how to leverage available technology, both resource management oriented software and off the shelf tools, to support the resource management process. Governance – Understand the elements of governance for Global Resource Management and what it takes to manage it all. More information is available in the downloadable RMCP® Handbook.